Stepan Bandera’s 106th birthday celebration passed on New Year’s day 2015 and the question of what it means in Ukraine is front and center again. Are there really nazis in Ukraine today? When the Prime Minister of Ukraine Arseni Yatsenyuk can say on German News “We cannot allow Russia to attack Ukraine and Germany again like the Soviet Union did in 1941” – Isn’t that case closed regarding ideology? Yet history and the facts are clear that the Bandera legacy has little to do with Ukrainian history except mass murder. Instead history shows the mass murderer and torturer Bandera’s greatest impact on the world was in North America through the OUN(Bandera’s nationalist army)-ABN (Anti-Bolshevik Nations)-UCCA (Ukrainian Congressional Committee of America), and Eastern European emigre groups. Stepan Bandera ordered the attempted assassination of one sitting US President as the last leg of an attempted nazi coup in the United States. Bandera brought one of America’s greatest war time generals and a sitting president to heel on more than one occasion. 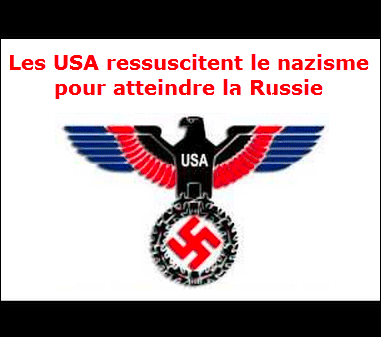 Bandera was directly responsible for US involvement in the Korean war which caused over 50,000 US servicemen to die. Bandera’s legacy was the real reason the United States went to war in Vietnam and another 50,000 servicemen gave their lives. The Bandera groups spent 60 years running the cold war propaganda machine both domestically in the US and internationally. Their propaganda was a large part of what made the defense industry and military budgets as large as they are. Their influence on American perceptions of the Soviet Union, Russia, and definition of Nationalism changed the way the US sees both itself and the world. Bandera’s legacy includes helping to build Al Qaeda, the Muslim Brotherhood rise as a powerhouse, and ISIL’s rise in the Middle East. When the veneer of Islam is stripped away only ABN-APACL-WACL fascism is left. As the proofs are laid out plain where will that put you? For the United States to take the international stance today it now assumes, no matter how uncomfortable it is to look at; domestically a large shift in how citizens perceive American Democracy had to happen first. The big question is does it matter? As the proofs are provided, you decide. In the 1930’s Stepan Bandera and the OUN sent letters to US president Franklin D. Roosevelt to gain US recognition for the right of Ukrainian nazis to set up their own country. This came at the same time as Adolf Hitler’s rise to power. President Roosevelt rebuffed Bandera’s efforts and made it clear this would never happen. This coup attempt culminated in a plan to assassinate sitting US President Franklin Delano Roosevelt. The assassination was planned between 1940-42. This was done even though there was already an investigation into the coup plot. Stepan Bandera ordered his favorite assassin to murder a sitting US President because Roosevelt refused to legitimize Bandera’s terrorist organization, the OUN-ABN-UCCA. Consider that this was the beginning of WW2 for the United States. What would have happened if the Bandera attempt had been successful? Consider what would have happened if the US came into WW2 under its own fascist government. Today there is only one official record of this occurrence and its not part of well known American history. Archives, College Park, Maryland; Pavel Sudoplatov, Spetsoperatsii. Lubianka i Kreml 1930-1950 gody (Moscow: OLMA-Press, 1998/2003) 26. Roosevelt ordered the investigation of the OUN-ABN-UCCA Ukrainian nationalists in the United States under the House Un-American Activities Committee for nazism. After Roosevelt’s successor Harry Truman took the presidency the OUN-ABN-UCCA were reclassified as anti-communists and the nazi investigation was closed. Instead of testifying to the US Congress about their own anti- American activities like treason and attempted assassination, the Bandera stood behind Senator Joseph McCarthy and wrote the questions that defined what it meant to be un-American and demanded the answers. Stepan Bandera and the OUN-ABN-UWC-UCCA leadership never answered for the assassination attempt or even apologized. Instead the Bandera groups were given large budgets to work with to promote the coup planners version of anti-communism in America. For the coup planners the only alternative was an American brand of fascism and the groups involved have spent 70 years tirelessly working at it. The American Liberty League, the working group behind the coup attempt went on to morph into the most powerful political engine in American history which was the China Lobby. One of the founders of the China Lobby was Yaroslav Stetsko. Stetsko was second in command to the Ukrainain nazi Stepan Bandera. His groups gave Senator Joe McCarthy the questions that defined what it meant to be a good American during the red scares. This mass murdering nazi became powerful enough in American politics to write points into Democratic and Republican presidential campaign platforms by the early 1950’s.